Buddy Club Racing Spec Radiator Cap UNIVERSAL - Dezod Motorsports Inc - Home of the automotive performance enthusiast since 2002. Higher pressures inside of the cooling system helps the coolant flow better and also increases the coolant’s heat absorbing qualities. The Buddy Club Racing Spec Radiator Caps have pressure capacities of 1.3 × 100kpa (1.3kg/cm2), in comparison to a factory cap that has a pressure rating of only 0.9kg/cm2. 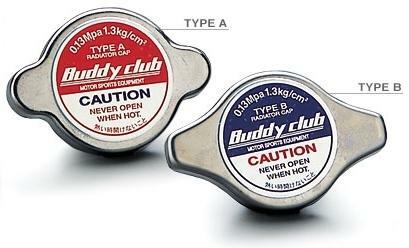 This means that the coolants boiling point can be raised by using the Buddy Club Racing Spec Radiator cap. Advantages are of course found on demanding conditions such as circuit racing. The radiator caps are available in two types; Type A and Type B.